NetworkSleuth is a network file searching utility, that allows you to quickly locate files across a network. You can search for specific file names or for specific file types (e.g. all MP3 files). NetworkSleuth can scan hidden resources and automatically login to restricted shares, using the provided login information. Network Sleuth is network file locator. The software allows to find files in Local Area Network and quickly locate files, documents, videos, mp3 and other file types across a home, office or corporate network. Network Sleuth is fast network file search utility. The software can scan hidden resources and automatically login to restricted shares, using the provided login information. The found files can be copied, moved etc. just as if you were working with Windows Explorer. NetworkSleuth provides a lightning fast search engine and includes the ability to search hidden network resources, restricted access resources, IP subnets and much more. It comes with a built-in password manager to store your network logins for resources with restricted access. NetworkSleuth allows to schedule search tasks to be executed automatically. Additional features include result sorting, filtering, search within results, minimize to tray, scanning inside zip files and exporting of results to TXT, HTML and CSV format. With Network Sleuth you can scan files, folders, hidden resources and automatically login to restricted shares. 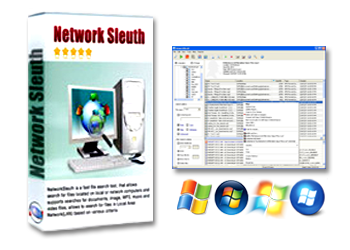 Network Sleuth is the easiest to use toolkit on the market.